Home > Blog > An Account of Heathrow Airport. It’s the Christmas Eve. A lot of people are coming and going through the Heathrow Airport to meet their loved loves and share the happiness and joy of the occasion. In a comparison, 2013 saw -0.4% passengers through its doors than 2012. But this number definitely shot up in 2014. We would definitely have to wait till 31st December for an exact figure. But the Christmas Getaway is going to see 5 million passengers. 698,000 flew through Heathrow in 7 days preceding the eve followed by 116,700 passenger on 19th December. On the day of Christmas Eve, more than 100,000 travelers are flying through Heathrow. 16,677 passengers from this number will be flying just before the Queen addresses to the nation. 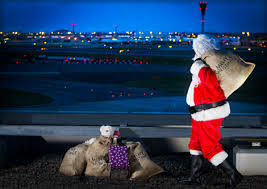 Christmas festivities at the Airport include Carol Singers, some of the kids’ favorite winter characters and Santa with his elves sharing the joy of Christmas and giving candy. There is an expansion proposal for Heathrow Airport to build a new runway. The passenger rate is estimated to increase further more so a new runway is required to accommodate them. But there are a few hinges in this too. Environmental pollution concerns and the competition with the Gatwick’s expansion plans are on the top. A competition is going on between these airports to get the decision in their favor. They are spending millions of ££ on advertisements and PR campaigns. But these immensely funded campaigns are being regarded as “Unfair Influence” by Sir Howard Davies; the head of the Airports Commission. Apart from all this, the festivities of Christmas are booming but there also is warning of extreme weather. So be prepared for that and make all your arrangements accordingly. Make secure car parking reservations at Heathrow airport along with your travel plans. So, you need not bother about anything at all on your holiday. Merry Christmas!!! Previous PostThe Manchester Fly Story.Next PostThe Birmingham Airport Yearbook. hello!,I really like your writing! I require a specialist on this house to unravel my problem. Maybe that is you! looking ahead to read you. First of all I want to say superb blog! I have had trouble clearing my thoughts and getting my head around this. But now i have got it. Many thanks! I think everyone could learn a lot from your blog.